A team of scientists participating in a radio astronomy summer school had the unexpected opportunity to observe a recently discovered near-Earth asteroid as it zipped past our planet on July 7. The observations were made using the combined power of the National Science Foundation's (NSF) Green Bank Telescope (GBT) in West Virginia and a radar transmitter at NASA's Deep Space Network in Goldstone, California. 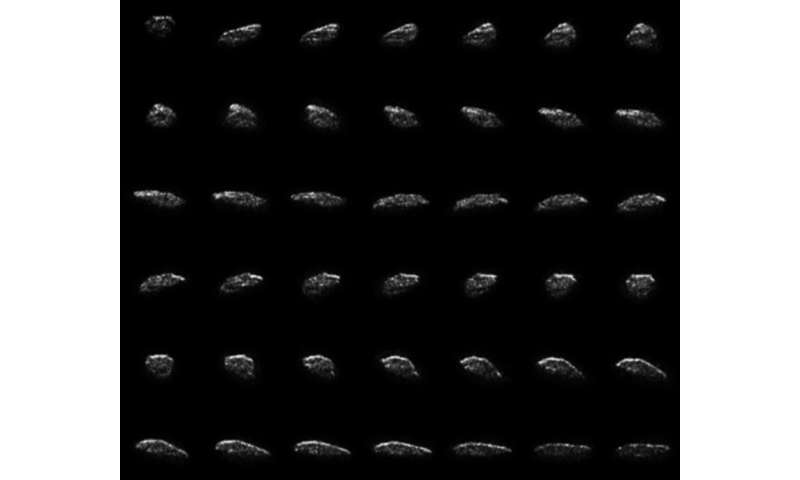 The new radar studies, which took advantage of a rare close encounter with an asteroid dubbed 2015 HM10, produced a collage of 42 images that spanned a total of 29 minutes (about 1.3 rotations of the asteroid). The images reveal a very elongated object that is only 80 meters across at its widest point. "Radar studies such as these are essential to fully constrain the orbit of these objects to determine if they pose any future risk," said National Radio Astronomy Observatory (NRAO) astronomer Toney Minter. At the time of the observations, 2015 HM10 was about 440,000 kilometers from Earth, or a little more than the maximum distance from the Earth to the Moon. To make these images, a continuous radar signal was sent from the transmitter at Goldstone to the asteroid. The reflected signal was then received by the 100-meter diameter dish of the GBT in a process known as bistatic radar imaging. This produced images with a resolution of about 3.75 meters per pixel, one of the highest resolutions of an asteroid ever obtained using this radar technique. The observations were taken during a biennial summer school on single-dish radio astronomy sponsored jointly by the NRAO and NSF's Arecibo Observatory. This educational program provides graduate students, post-doctoral researchers, and experts in other fields of astronomy with both knowledge and practical experience of the techniques and applications of single-dish radio astronomy. "It was a fortunate coincidence that asteroid 2015 HM10 was in position to make these observations," noted NRAO astronomer Alyson Ford. "With the help of NASA, we were able to perform a particularly exciting observing session with these astronomers and demonstrate the power of radio astronomy to study near-Earth asteroids." "This observation, which was the first with a new transmitter on the 34-meter DSS-13 antenna at Goldstone, demonstrates the unique capabilities of radar astronomy," said Lance Benner, a scientist with NASA's Jet Propulsion Laboratory (JPL) in Pasadena, California, and member of the observing team. "It was amazingly fortuitous that this could also be a teaching opportunity for astronomers just learning about these observing techniques." The radar transmitter on DSS-13 is an experimental test facility that was actually designed for spacecraft communication. NASA's Deep Space Network allowed it to be used for this observation since the regular radar transmitter was unavailable at the crucial moments of the flyby. The radar data were then processed by JPL engineer Joseph Jao. Shantanu Naidu, a JPL postdoc and graduate of the single-dish summer school from a previous year, prepared the animation and collage of images. The asteroid was originally discovered on April 19, 2015, with the Dark Energy Camera on the NSF-funded, 4-meter Blanco Telescope at Cerro Tololo in Chile.